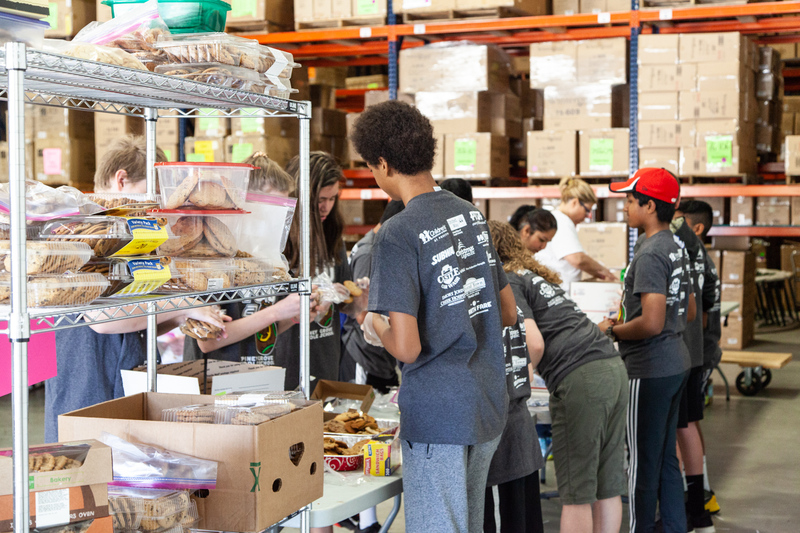 Alpharetta, Ga, May 4, 2018 -- Wintergreen Corp. hosted students from nearby Piney Grove Middle School as they boxed up over 6,000 cookies to ship to U.S. troops overseas as part of their school's "Grizzly Great Day of Giving," or G3. The annual cookie pack is held in conjunction with Treat the Troops. Students also prepared beads to be turned into jewelry and sold in support of Just One Africa. Piney Grove Middle School students pack cookies, cards and handwritten notes for the troops at Wintergreen Corp.'s headquarters as part of the schools annual Grizzly Great Day of Giving community service event, held in conjunction with Treat the Troops. Each year Wintergreen opens up its 100,000-square-foot headquarters and distribution facility to students and parent volunteers participating in Piney Grove's G3, an annual event in which students fan out into the community to perform acts of service. Since 2013, the event has involved Treat the Troops, a nonprofit dedicated to packing and shipping cookies, treats, cards and letters to U.S. troops stationed outside the country. This year for the first time the event also featured students cleaning and preparing beads made from recycled paper, purchased from Maasai women in Kenya, that will be made into jewelry and sold to raise funds for Just One Africa. Just One Africa is a nonprofit devoted to providing care for orphans and vulnerable children in Kenya. It was co-founded by the parents of a former Piney Grove student. "We're so appreciative of Wintergreen opening up their facilities to give our students the opportunity to get involved in the work of these wonderful organizations," said Pam Pajerski, Principal of Piney Grove. "This is such an important lesson for our students to learn: that even one person can make a positive difference in the world, and many people working together can make a big difference." Wintergreen plans to continue its support of Piney Grove's Grizzly Great Day of Giving and encourages other local businesses to get involved both with G3 and with Treat the Troops and Just One Africa. 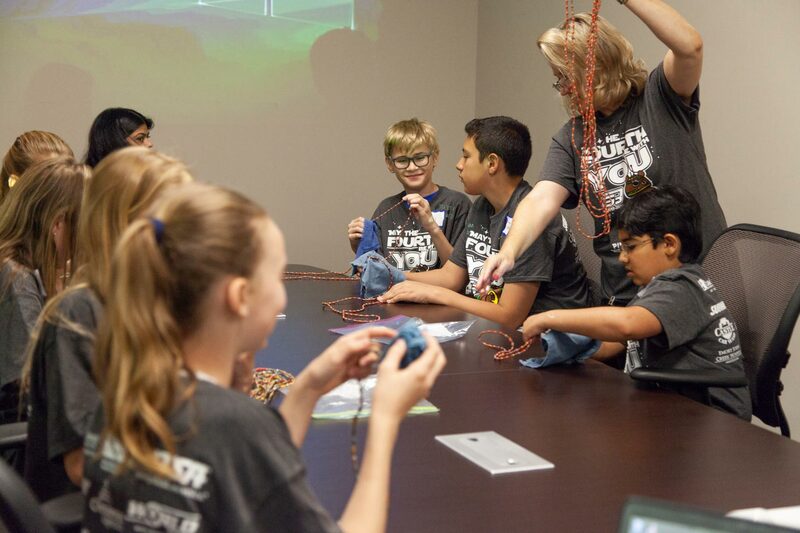 At the headquarters of Wintergreen Corp., Piney Grove Middle School students clean and prepare beads made from recycled paper that will be made into jewelry in support of Just One Africa, a non-profit that provides care for vulnerable children in Kenya. "These organizations do invaluable work in making the lives of people around the world better," said Chris Miller, Co-Owner of Wintergreen Corp. "Whether it's our troops protecting lives in faraway countries, or vulnerable children in Kenya, the needs are great. We are proud to join with Piney Grove Middle School in supporting the organizations that help meet those needs." Treat The Troops (http://www.treatthetroops.org) is a non-profit organization dedicated to letting deployed American military personnel know that people at home are remembering them. Treat the Troops sends home-baked cookies and other comfort items, along with a note of thanks, to the troops via the U.S. Postal Service. Just One Africa (http://www.justoneafrica.org) is a non-profit organization dedicated to caring for orphans and vulnerable children in Kenya by providing access to clean water and by partnering with local leaders to provide sustainable solutions which create hope through care, education, and community development.